Contact lenses have changed millions of people’s lives and as practice we have hundreds of patients wearing lenses, from 8-year olds to 88-year olds. They are simple and convenient and are now available in practically all prescriptions. 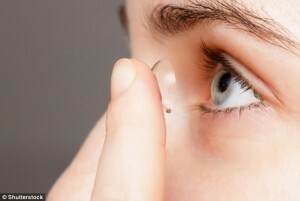 Contact lenses can be worn daily or just occasionally and come in both daily disposable and monthly forms. When you come in for a contact lens fitting appointment, your Optometrist will discuss your needs and lifestyle to choose the best lens type for you. We fit MiSight lenses to slow down the progression of short-sightedness in children, ortho-K lenses to correct vision while you sleep, multifocals for those who need varifocal vision in a contact lens and all-round lenses to correct vision without the need for glasses. Have regular six month contact lens check-ups. Always wash and dry your hands before handling your lenses. Do not clean lenses with tap water. Do not shower, sleep or swim in your lenses, unless specifically advised by your Optometrist. Always store your lenses in the recommended solution. Stick to your recommended wearing schedule. Do not wear any lenses other than those prescribed by your Optometrist. If you would like more information about contact lenses or wish to give them a try, please contact the practice. If you love your eyes, love your lenses.